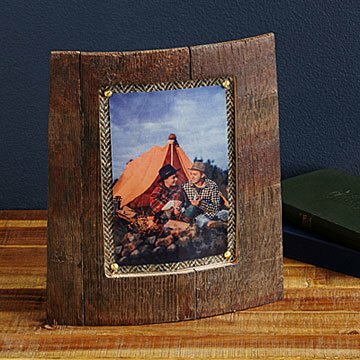 Sections of reclaimed whisky barrels serve as distinctive photo frames. For some, the perfect picture is an oak cask quietly aging a fine, single malt Scotch. We're sure that Scottish frame makers Kristen and Ross Hunter would agree. Their photo frames are crafted from segments of retired whisky (no e in Scotland) barrels, each a one-of-a-kind snapshot of the craftsmanship and individual history of the cask. The design utilizes the elegant curve of the original barrel for a freestanding frame (also includes wall-mounting hardware on the back). The back displays two cask characteristics: the charred lining that imparts much of the flavor and color to the whisky, and the croze—the groove that holds the head of the barrel. The front features a window for a 4 x 6 photo, held in place with copper screws on a background of Harris tweed. As the frame is made from reclaimed, weathered casks, textures and overall dimensions will vary slightly, making each one truly unique. Handmade in Edinburgh, Scotland, once home to eight licensed distilleries and hundreds of unofficial stills. Husband-and-wife team Kristen and Ross Hunter bring creativity and an entrepreneurial spirit to interpreting the rich history of Scotland through their whisky barrel wares. Ross’ engineering background and Kristen's passion for art and design both drive their rustic yet refined designs. Together in their workshop near Edinburgh, they love to create new products utilizing industrial materials infused with history. Read a bit more about what inspired Kristen and Ross to start crafting fine frames on the blog. Keep away from extreme temperatures and moisture as this could cause the wood to shrink or expand. Beautiful quality frame made with love and such a great back story. Should have bought one for myself!! This item is so special, I will be buying one for myself as well. This frame was perfect for my boyfriend who loves whiskey and one of a kind items. This will be for my husband's desk at work. He works in a newer, open space office think this frame will look great there. So lovely, I am buying another one. Perfect gift for fathers day, wedding party, or just a unique treat for yourself. Got this as a bday gift for my b/f, and printed a picture of him and his daughter to go in it. Turned out PERFECT! Frame is wonderful quality & looks amazing! Very unique and looks great on our bar next to our mini whiskey barrel! This frame is beautiful. It is rustic and heavier than I thought which was a nice surprise. The cloth around the picture is really unique too.